As an outreach and support peer, Matthew Gregorchuk helps his fellow Golden Hawks articulate and achieve their career goals. 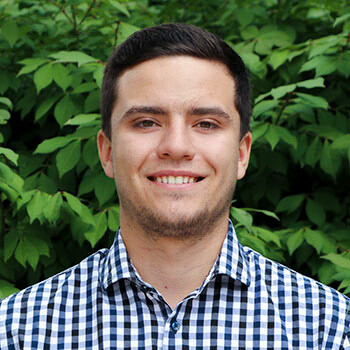 Gregorchuk, a third-year student in Wilfrid Laurier University’s Bachelor of Business Administration (BBA) program, found a new appreciation for career development as a key part of the student experience when he completed the Career Development Certificate in 2017. The certificate is comprised of workshops focused on career decision-making, writing effective resumés and cover letters, and interview and networking techniques. Gregorchuk’s own success led him to seek out his current role within the Career Centre’s Peer Program. Each year, about 10 students from Laurier’s Waterloo campus are recruited as Career Centre Peers (CCPs), a group of outreach and support volunteers who build and share their knowledge of career development strategies. With the introduction of the program in 1981, the Laurier Career Centre became a leader in Canada, delivering workshops for colleagues across the country. A main focus of the outreach and support team is peer-to-peer resumé building. In the 2017-18 academic year, the CCPs conducted over 450 drop-in resumé support appointments. Stacey Campbell, a Laurier career consultant, has managed the peer program for over 10 years and says she has seen significant growth in both the program and the students involved. “Resumés are highly personal documents, and to empower peers through the resumé consultation process helps the CCPs to develop professionally, and it builds their confidence,” says Campbell. CCPs receive specific skills-based training in the areas of resumé fundamentals, accessibility and equity, building effective LinkedIn profiles, and training in more complex areas of foundational coaching and counselling skills, consultation techniques, and mentorship. Outside of the drop-in hours held at the Career Centre, the outreach and support team sets up shop in more public areas around campus, providing just-in-time assistance to students needing some resumé direction and hosting career development events. Their outreach efforts extend online through blogs, alumni career profiles, and contributions to the monthly Career Centre eNewsletter. In addition to the outreach and support CCPs, Campbell organizes a group of video production peers who take the lead role in conceptualizing, scripting, and producing short educational and promotional videos. The educational videos feature career development topics including the art of networking and getting the most out of Laurier’s employer recruitment sessions. Alumni interviews give the CCPs a chance to network with industry professionals and give all students a glimpse into what their life could look like after graduation. “Interviewing alumni and writing about their career path helps peers answer the pressing question ‘What’s out there for me?’” says Campbell. When students find their own answer to that question, Gregorchuk knows that he’s made a lasting impact. Campbell notes that many students who have held the CCP role have left considering consultancy as a career path. Gregorchuk is one of these students. Applications for CCP roles open every February for the following academic year. For further information about the CCP program at the Waterloo campus, email Stacey Campbell at slcampbell@wlu.ca. If you are interested in volunteering at the Career Centre at Laurier’s Brantford campus, email careerbrantford@wlu.ca.